Anthracnose of cucurbits, caused by Colletotrichum orbiculare, is a serious disease of cucurbit crops in warm, rainy summers. Lesions can form on seedlings, leaves, petioles, stems, and fruits. The pathogen affects cucumbers, melon, squash, watermelon, and pumpkins. Pathogenic specialization according to ability to infect cucurbit genera, species, and cultivars has been reported. Races 1 and 3 primarily infect cucumber and melons, while Race 3 occurs mainly on watermelon. Symptoms on seedlings occur as wilt of cotyledons and stem lesions near the soil line when the fungus is seed borne. On mature leaves, small pale yellow, water-soaked areas emerge near veins and enlarge rapidly, turning tan to dark brown. The spots may coalesce, resulting in blighting, distortion, and death of entire leaves. The dry, dead centers of old lesions often crack and tear, giving a ragged appearance to the foliage. 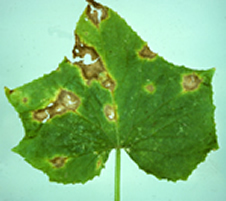 Lesions on petioles and stems are elongate and slightly sunken. Young fruit may turn black and die if their pedicels are infected, while older fruit develop circular, noticeably sunken, dark-green to black lesions which may exhibit a salmon colored exudate in moist weather. C. orbiculare is both seed and soil borne and can cause losses when control measures are not practiced. The pathogen survives between crops in infected crop debris, in volunteer plants, or in weeds of the cucurbit family. It can be carried on seed harvested from infected fruit and spread by the feeding of cucumber beetles. Frequent rains, warm temperatures (74-78° F), and high humidity favor the development of anthracnose. The fungus does not require a wound for infection to occur and is spread by splashing water, workers, and tools. Infected fruit may have a bitter or off taste and deteriorate quickly when invaded by secondary, soft-rotting organisms. Plant only certified disease-free seed. Rotate out of cucurbits for at least two years. Control all weeds, especially volunteer cucurbits. Collect and burn or plow down deeply all infected crop debris after harvest. Grow cultivars with resistance to the common races of anthracnose. Avoid wounding fruit during harvesting. Immerse fruit in clean and fresh water containing 120 ppm chlorine. Chemical control can be obtained through a regular spray program of eradicant or protective fungicides. Coverage of leaf undersides and fruit is crucial to success.